Philadelphia's docks. Unbeknownst to the city's inhabitants, all the necessary ingredients for an unprecedented health disaster were now in place. With them, the Caribbean refuges brought Yellow Fever. Philadelphia's ravenous mosquitoes provided the perfect vehicle for spreading the disease by first lunching on an infected victim and then biting a healthy one. The first fatalities appeared in July and the numbers grew steadily. The afflicted initially experienced pains in the head, back and limbs accompanied by a high fever. These symptoms would often disappear, leaving a false sense of security. Shortly, the disease would announce its return with an even more severe fever and turn the victim's skin a ghastly yellow while he vomited black clots of blood. Death soon followed as the victim slipped into a helpless stupor. Unaware of the link between the mosquito and the disease's progress, Philadelphia's medical community was dumbfounded. 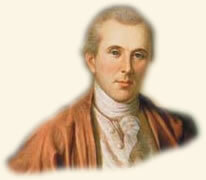 Dr. Benjamin Rush, the city's leading physician and a signer of the Declaration of Independence, advised citizens to flee the city. He worked tirelessly to comfort and save the the hapless victims, but with little success. 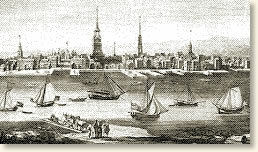 A good portion of the population, along with members of Congress, President Washington and his Cabinet, abandoned the city. The disease subsided and finally disappeared with the arrival of cold weather in November. It is estimated that 2,000 died. "The horrors were heart rendering." "I had scarcely become settled in Philadelphia when in July, 1793, the yellow fever broke out, and, spreading rapidly in August, obliged all the citizens who could remove to seek safety in the country. My father took his family to Bristol on the Delaware, and in the last of August I followed him... I was compelled to return to the city on the 8th of September, and spend the 9th there.Everything looked gloomy, and forty-five deaths were reported for the 9th. And yet it was nothing then to what it became three or four weeks later, when from the first to the twelfth of October one thousand 'persons died. On the twelfth a smart frost came and checked its ravages. The horrors of this memorable affliction were extensive and heart rending. Nor were they softened by professional skill. The disorder was in a great measure a stranger to our climate, and was awkwardly treated. Its rapid march, being from ten victims a day in August to one hundred a day in October, terrified the physicians, and led them into contradictory modes of treatment. They, as well as the guardians of the city, were taken by surprise. No hospitals or hospital stores were in readiness to alleviate the sufferings of the poor. For a long time nothing could be done other than to furnish coffins for the dead and men to bury them. At length a large house in the neighborhood was appropriately fitted up for the reception of patients, and a few pre-eminent philanthropists volunteered to superintend it. At the head of them was Stephen Girard, who has since become the richest man in America. In private families the parents, the children, the domestics lingered and died, frequently without assistance. The wealthy soon fled; the fearless or indifferent remained from choice, the poor from necessity. The inhabitants were reduced thus to one-half their number, yet the malignant action of the disease increased, so that those who were in health one day were buried the next. The burning fever occasioned paroxysms of rage which drove the patient naked from his bed to the street, and in some instances to the river, where he was drowned. Insanity was often the last stage of its horrors." "The attendants on the dead stood on the pavement soliciting jobs"
opening the door he found him lying on the floor delirious and in a burning fever. Fearful of alarming his family, he kept it a secret from them, and went to the committee of health to ask to have the man removed. That committee was in session day and night at the City Hall in Chestnut Street. The spectacle around was new, for he had not ventured for some weeks so low down in town. The attendants on the dead stood on the pavement in considerable numbers soliciting jobs, and until employed they were occupied in feeding their horses out of the coffins which they had provided in anticipation of the daily wants. These speculators were useful, and, albeit with little show of feeling, contributed greatly to lessen, by competition, the charges of interment. The gentleman passed on through these callous spectators until he reached the room in which the committee was assembled, and from whom he obtained the services of a quack doctor, none other being in attendance. They went together to the stable, where the doctor examined the man, and then told the gentleman that at ten o'clock he would send the cart with a suitable coffin, into which he requested to have the dying stranger placed. The poor man was then alive and begging for a drink of water. His fit of delirium had subsided, his reason had returned, yet the experience of the soi-disant doctor enabled him to foretell that his death would take place in a few hours; it did so, and in time for his corpse to be conveyed away by the cart at the hour appointed. This sudden exit was of common occurrence. The whole number of deaths in 1793 by yellow fever was more than four thousand." Samuel Breck's account appears in Hart, Albert Bushnell, American History Told by Contemporaries, vol. 3 (1929); Powell, John Harvey, Bring Out Your Dead, The Great Plague of Yellow Fever in Philadelphia in 1793 (1949). "Yellow Fever Attacks Philadelphia, 1793," EyeWitness to History, www.eyewitnesstohistory.com (2005). The relationship between the mosquito and the spread of Yellow Fever was conclusively demonstrated in 1900 by Major Walter Reed in Cuba following the Spanish-American War.